Extension poles are part of every window cleaner’s set of tools. They are essential to the job of cleaning windows and getting that job done. A pole system allows a person to assemble a pole for window cleaning to the length that is needed. For example, it can allow a window cleaner to assemble a pole for window cleaning with extended lengths from 4 feet to 30 feet. As a result, a 30-foot pole will allow a window cleaner to reach most 2 story windows and some 3 story windows. Using only the sections needed cuts down on the weight of the pole when cleaning windows, allowing more work with less fatigue. With every tool though it’s important to understand how it works. 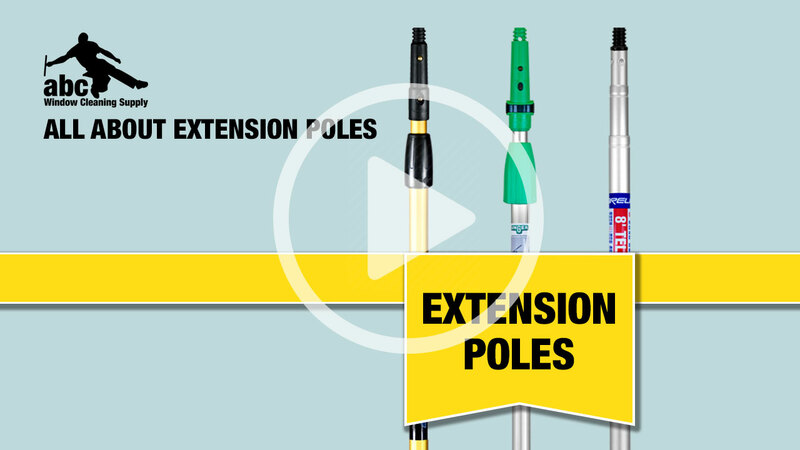 Here are the important points to consider regarding extension poles for window cleaners. There are two main types of locking mechanisms, external locking collars, and internal locking collars. Adjustments are made to external locking collars by loosening and tightening the collars that are on the outside of the pole. Examples of poles utilizing external locking collars are the Ettore REACH, Unger Add-An-Arm and Triple Crown Poles. The locking mechanism for internal locking poles is inside the pole, which means the pole is free of collars. The exterior of the pole is therefore smooth when handling and won’t catch. 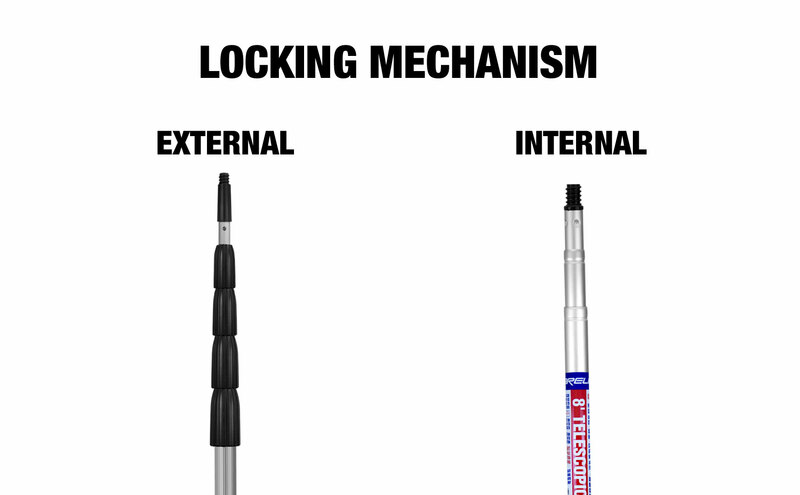 An example of an internal locking pole is the Garelick Telescopic Pole. In either case, make sure not to over tighten. It doesn’t take much to hold the sections in place, and over tightening can break parts. Most poles will come with a combination tapered and threaded tip, meaning that they will work with tools that wedge on to the taper, as well as tools that need to thread on with standard American acme threading. Some poles, such as Garelick poles, only have threaded tips. This means they will only work with threaded tools. However, a simple threaded wood cone (which comes free with the purchase of a Garelick pole from abc) can get those tapered tools onto that pole. 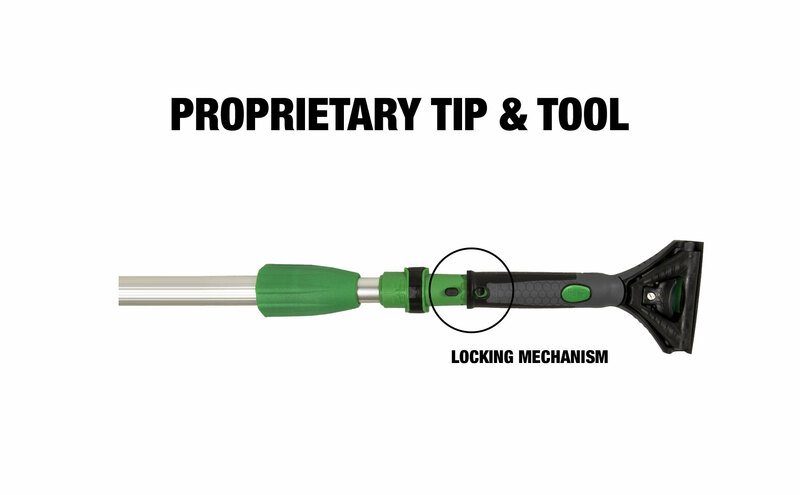 Some brands, such as Ettore and Unger, include proprietary tips that will still work with other tools, but if used with the same brand, they have locking mechanisms that will hold the tool in place. But if brands are mixed, the other tools will still wedge on there; the holes just won’t line up. There are two lengths to a pole, extended and unextended. When the length of a pole is noted, it is most often referring to its extended length. An 18-foot pole will extend up to 18 feet, and a 24-foot pole will extend up to 24 feet. 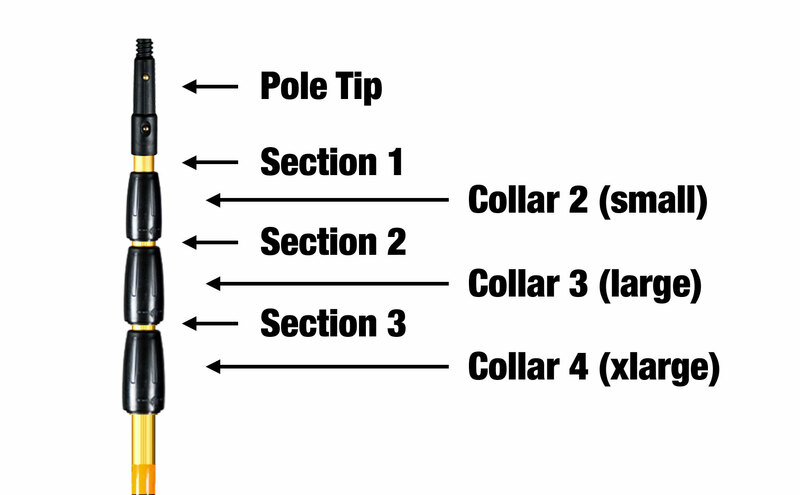 The number of sections a pole has will also be noted, such as 2, 3, or 4 sections. A 3 section 18-foot pole will collapse down to roughly 6 feet. The collapsed size is its unextended length. Pole Length: What Length Do You Need? Short poles, 8 feet or less, are ideal for reaching tall ground level windows. Poles 24 feet or longer will allow you to reach most second story windows and some third story windows. If any part of a pole breaks, most parts are replaceable, meaning the entire pole won’t have to be replaced. When considering which part of a pole needs replacement, count from the top section down. The pole begins with the pole tip and the section it’s connected to; that is section one. The next section after that is section two, and then section three, all the way down. The first collar, which is connected to section number two, is often called either the small collar or the number two collar. The next collar, which is on the three section, is called the number three collar or the large collar, and it works its way down from there. Whether the window is an easy ground level or a high third story, extension poles are essential for every window cleaner. Luckily, there’s a style and length of pole available to fit the need for every job. To learn more about what each pole offers, explore their descriptions on the abc website.